I've seen some crazy videos in my day, but this insane. Well, at first glance it was anyway, and the Internet has gone crazy about it. Now, that I know what happened it totally makes sense and I'm not as freaked out about it. So, as you can see in this video, a woman appeard to vanish into thin air during a live news report on Danish TV....But did she really? 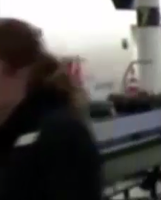 The video, which has gone viral, shows the blonde woman standing in the background of the shot as a man was being interviewed at an airport's baggage claim for TV2's Sports Center show. Another woman walks past her, pushing a trolley, and then she seemingly disappears. Some viewers have speculated that the seemingly magical woman was a ghost. Others claimed her vanishing act was down to "alien activity." Unfortunately, if you look closer, and I mean really close, you can actually see what really happens. The woman just coincidentally happens to move off at the same exact time as the trolley-pusher. Her blue jeans are visible through the gap between the other woman's arm and body. You can also see traces of her blond hair, just slightly behind the brunette's head. Yes, this was very creepy, but it's not any sort of paranormal activity. The clip was featured on TV2's late night talk show, The Night Shift on Wednesday and ended up circulating around the Internet on Thursday. The show confirmed that the man being interviewed was Denmark's national women's handball head coach, Klavs Bruun Jorgensen.....Um, national women's handball head coach? Did anyone else catch that? Denmark has a national handball team? What the hell? That makes two things that blew me away in this story! The woman, who appeared to have vanished was handball expert Trine Jensen. Wait! There's a handball expert too? I think I'm giving up on life now that I know handball is a national sport in Denmark and women are disappearing on national TV!